Brandon Macz: John Holt put up his Trump countdown sign shortly after the inauguration in 2017. New owners Lilly and Paul Onnen agreed to keep it up and current when they bought the Leschi home last year. Former Leschi resident John Holt has spent the last two years counting the days until Donald Trump’s presidency ends. Those passing his old house on the corner of 31st Avenue South and South Jackson Street know exactly when that will be, thanks to a homemade sign above the garage. A retired digital marketer, Holt made the sign himself. Holt ended up using aluminum signs he found at a hardware store, to which he added vinyl numbers. He then attached the numbers to teacup hangers. Holt and his wife Susan purchased the 1905-built two-story house in 2005, and lived there for the next 13 years. The Holts downsized and moved to Magnolia last year, selling their Leschi home to Lilly and Paul Onnen. Onnen said she loves the historic house, with its views of Mt. Rainier in the winter and summer foliage. “It has retained a lot of its original heritage inside the home, and it’s a real beautiful home,” she said. 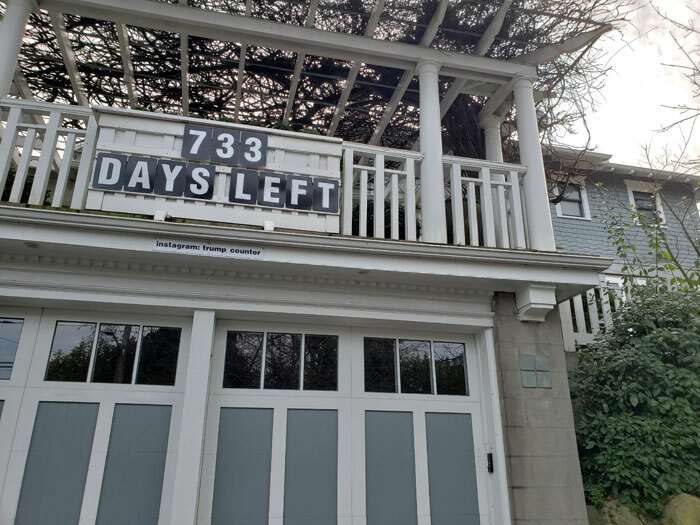 The Onnens are keeping the sign updated every day, and Holt has made another countdown sign for his new Magnolia home, though it’s less prominently featured. Rather than go to Leschi every day, Holt records about 100 photos over the course of more than an hour; he keeps detailed notes. He knows the halfway point for Trump’s presidency was Jan. 21, and the counter hits zero on Jan. 20, 2021. “We moved a year ago, but if I stand out there for a minute, people honk, cheer, yell, ‘Make it go faster,’” Holt said. He once found a $25 gift card in the mailbox left by an admirer of the sign. Onnen said someone smashed her windshield with a baseball bat shortly after an interview with KING 5 about the Trump counter. But that didn’t change the Onnens’ decision to keep the sign ticking off the potentially final days in office for the 45th president. There’s also that agreement with Holt. The neighbors seem fine with the sign, and have offered to turn the numbers when the Onnens are traveling, she said. Holt will continue to maintain the Instagram account; each post with a short essay about Trump, usually recapping what he did that day. The partial shutdown of the federal government has been a hot topic for the past month. Onnen said she has a cousin who works for the FBI, which is having to prioritize cases because there isn’t enough funding to investigate them all.